You are always in a constant need to look for a suitable place where you can change your baby’s diaper. You would always have the need to change your baby’s diaper at least every two to three hours that’s about six to eight times a day at least. The problem comes when you’re running out of comfy places to change your baby’s diaper in. If you do it on the bed, you might risk some undesirables slipping on your sheets. If you use a mat, oftentimes when the need comes to immediately change your baby’s diaper, you forgot where it is. If you do it on any surface, your baby might get fussy and uncomfortable. It’s a real puzzle sometimes when it comes to really choosing where you should be changing your baby’s diapers. This is when the handy baby changing table becomes a life saver. You have everything you need in it because it practically has compartments for everything that you need: diapers, baby wipes, powder, diaper rash cream and everything else that you need to keep your baby’s bottom clean and comfy. There are so many baby changing tables out there—now they’re even combined with baby dressers—and all comes with perks that you might not even be aware of. Anyway, be assured that we have already given this a thought and tested out quite a number of these tables and came out with the top 5 best baby changing tables in the market. You don’t need to worry much about buying something you will soon later regret. Here is our list of best changing table dresser combo or just simply the best baby changing table. 35.4 x 31.1 x 40"
17 x 47.2 x 40"
19 x 37.5 x 37.5"
39.8 x 19.2 x 37"
Some mommies and daddies change their babies on the bed, on the floor, on a counter or anything that they can just put their baby on flat on his/ her back. Well, you don’t really have to be that undecided and also unhygienic for your child. Changing your baby’s diaper in any place may expose them to bacteria lurking around the corners and we don’t want that for our children now do we? Then, this baby dresser organizer might be the right pick for you. Ranking as our top best changing table dresser combo is the Athena Leila 2 Drawer Changer. The first reason why we, at ParentsNeed HQ, love this changing table is because it’s sturdy. It is made of wood and it was designed to create an ideal space for your baby to change his/ her diaper. It comes in two colors: Cherry, and white. The reason why we love this best baby dresser is because it is really easy to assemble with a very easy-to-follow manual of instructions to assemble the drawer. What’s another thing that’s so great about this table or combo is that it comes with a wide drawer space where you can add an extra basket or two making it become a host for the best diaper changing kit ever available. This works perfectly well with any household because for a changing baby dresser, it works well as just a simple dresser in any room. If you no longer need that changing table for baby, especially when they’ve already graduated from the diapers, then you don’t necessarily have to sell it to gain something from it. Because it is designed like a dresser, it makes a perfect corner changing table or simply just as corner table. It also works well with other furniture and fixtures you might have in your house. This best baby changing dresser is perfect for every household simply because it is spacious; it has plenty of huge compartments to put all the diaper changing needs and even your baby’s clothes together. It’s an all-around furniture that your baby definitely needs. Although, you have to beware of the assembly of this baby diaper changer because it has plenty of smaller fixtures that are pretty difficult to put together. Modern modern modern chic! Those are the best words we could ever describe this Ikea changing table dresser. This modern chic table comes in such a simple and contemporary design; you might actually just want to buy it because of the way it looks. Anyway, there are so many reasons why we love this baby dresser Ikea made for us. First of all, this Ikea baby changing table is made of Medium Density Fiberboard or MDF. MDF is a building material that is made out of wood fibers. It is strengthened with resin, heat and pressure making it a really sturdy and eco-friendly alternative for plywood. Not only is it light but it is also very environment-friendly. It uses baby safe chemicals like acrylic for paint that doesn’t have many chemical threats to our babies who will be constantly borrowing the help of this changing table Ikea has designed. We love the fact that this is so customizable. Upon assembling it, you can adjust the height the suits you and your family well. The shelving units may also be changed depending on how you want them to be put. But the fact always remains that is comes with differently sized drawers, and three divisions that you can use for other storage﻿ purposes. This baby dresser Ikea has created is also multipurpose; the changing station on the dresser is detachable and can be flipped over to use it as a desk. 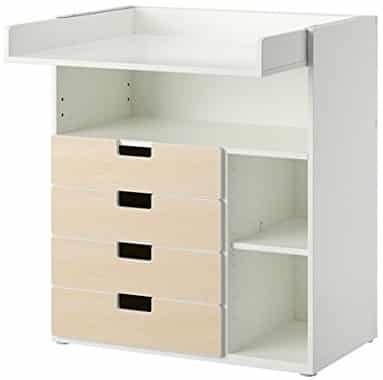 You can also use this Ikea baby changing table as a practical shelving unit once your baby has already shifted from diapers to potty. The practical function of this best baby dresser changing table will never lose its purpose. You will know a good set of drawers if you see one and definitely, looking at the South Shore Angel Changing Table will definitely tell you, ‘sturdy’. This heavy wooden baby changing dresser can also handle children aged 4 or more—you wouldn’t really expect your child to still be wearing diapers at that age, do you? We really love recommending this product because it is made of non-toxic laminated particle board. It is also a cheap changing table that fits every mom and dad’s budget but is sure to last for a long time. We love that this is very practical and it easily matches your living room furniture. It also easily matches with the colors of your beds and other furniture around the house. It makes a good changing corner for baby as it has all the differently sized drawers that answers to all the requirements of the best diaper changing kit. The only trouble with this one is that it’s pretty heavy so assembling it can be a slight hassle but nonetheless; its easy to understand instruction manual is very detailed that assembling it won’t need two pairs of hands. We also like the South Shore Angel Changing Table because it comes with a touch-up marker. So if in case you were less than careful in assembling your baby’s South Shore Angel Changing Table, then you can just touch-up the dents and scratches with the touch-up marker. Once again, it is a baby changing dresser that really looks nice in your living room, your small corner in the house for baby or the baby room. Wherever you put this is, it will always feel like it belongs. Another thing to remember about this changing table for small spaces is that you can completely remove the allotted space for the best travel changing pad and use the top of the dresser as a practical display space. You don’t have to worry about where you should put this baby changer when diapers are no longer on your buying list of baby items. You can just move it to your bedroom and use it as your own dresser. There is always something so warm in basket drawers. They offer this really nice and rustic gentle feel that you just can’t seem to shake off and it just seems like it’s a perfect and motherly design that is suitable for our babies. Badger Basket Baby Changing Table is one of a kind. You won’t often find basket cabinets in the market and more so with a baby changing space on top so you can change your baby’s diaper without having to worry about getting your bed sheets soiled. It is made up of strong metal posts that can handle your baby up to 25 pounds. It also comes with a safety railing so you are sure that your baby won’t roll off while you change his/her diaper. The changing station is lined with hardwood with a non-toxic finish to ensure your baby’s health. We also love the fact that this best baby changing dresser isn’t picky about the size of pads used on it. It uses the standard size for any of the best travel changing pad. This cheap changing table is nothing less of a quality but rather a very inexpensive must have for mommies. It comes with many features that include a safety belt just in case you have a very active child. It also comes with a contour changing pad. It is a good way to keep your n﻿﻿ursery room tidy and organized. It even has these card holders to label what is inside each basket. Not only is this aesthetically wonderful, it is also fairly easy to clean. You can easily wipe the metal bars with a damp cloth and not worry about molds or termite infestation while you can just dump the baskets into the washing machine for a nice quick and easy clean. This is a practical and light way to keep your baby’s things organized. You are also guaranteed to have this as a keeper long after your baby grows out of the diaper era. In fact, it makes a good storing cabinet for tiny clothes or light blankets or still as a baby dresser organizer for your little one’s stuff. However, it is not made for heavy storage since the basket supports are also made of cloth and not wooden panels that support the baskets in place. Along with this nursery changing table is a Babyletto contour changing pad, to give your babe a soft and comfortable cushion while he/she gets his/ her diaper changed. Your baby will surely love this item, no doubt and so would you. The Babyletto Hudson Changing Dresser comes with perks you will definitely enjoy. Firstly, you don’t need to change your baby’s diaper elsewhere and leave those strains of pee or baby crap on sheet or the carpet. Secondly, the design is so simplistic yet so beautiful; it makes wonderful clean looking furniture. Thirdly, it’s practical to use since it has three drawers and a cabinet with inner shelves. The small changing table dresser comes with metal gliders that allow you to smooth out those drawers without having to worry about it getting stuck in the casing. This is truly one of the best changing tables for babies because it includes an anti-tip kit. We know how playful children loves climbing stuff and this dresser won’t tip even if they do go on top of it—although, you still have to be careful and keep a watchful eye, it may not tip but they may fall off. What’s good about this is that it is compact. It doesn’t overwhelm your nursery room or any of the space you intend to put it in. it is just exactly the right size for you and your baby so that you can enjoy a wider looking room (especially in a petite home) with just as much useful space as you can get. Not only does this baby changing table toppers have spaces or carved baskets in them to put your changing diaper kit essentials, it also come off to reveal a flat top cover for your dresser. With this, it can outgrow the diaper changing function as much as your baby outgrows his/ her diaper for underwear. You won’t go wrong with this product. The only hassle you end up facing is a one-time big-time difficulty in assembling this piece of lovable furniture. Your baby’s needs are always a priority, no matter what they are wonderful furniture that will keep your baby safe, healthy and comfortable. It is one of the best things we could do for our growing bundle of crazy love and joy. So treat your little tot to the best diaper changing table instead of changing her on the carpet or any other bed out there.